Water-pigs are with their size of 1- 1,3m the largest rodents. Their big head is nearly rectangular, their ears are small , their fur is yellow-reddish and they have some webbings between their toes. They feed on grass and water-plants. In case of danger, they flee into the water. 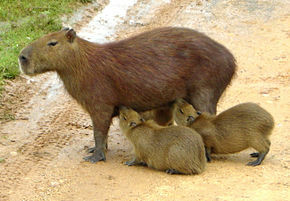 People are sometimes breeding Capibaras on their farms, to get their meet and their fur to produce leather.